Gangsters have just committed the robbery of the century, but now comes the most difficult part: sharing the loot! The heist went off without a hitch. You all did your jobs like professionals, in and out. All that's left is to divide up the loot, even split, nice and easy. But I can see, by the look in your eyes, that maybe... Maybe you feel like you deserve a little more. And maybe you're willing to pull a gun to get it. Maybe everyone else is too. 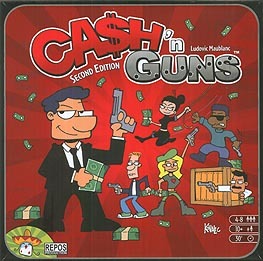 Cash 'N Guns is a bluffing game that you may have seen played at gaming nights. You'll know if you have; it's the one where people point foam guns at each other, and quote gangster films, and laugh lots. The concept is that, each round, a new bunch of loot is put down, you decide if to load your gun with a "click" or a "bang" card, and then everyone aims at someone else around the table. Everyone looks round, sees how many people are pointed their way, and decides how brave they are, then either back out... Or take their shot. Everyone who stayed in and doesn't get a wound divvies up the loot between them, and then you move on! After 8 rounds, any survivors count up the dough, and whoever scored biggest wins. If you played the original version of Cash 'N Guns, this one is a little different. There're no "Bang! Bang! Bang!" cards or shame tokens, loot is divided differently, there's a Godfather each round who gets first dibs on the loot and can order someone to switch target, no undercover cop, there's an optional set of special ability cards... that sort of thing. The core of the game is the same though, and it's damned good fun. For £25? It's a steal. This is a fun game of bluff where players are gangsters gathered together to split the loot, when fighting breaks out! Each player gets a foam pistol, 8 bullet cards and a standup figure. Each round 5 cash tokens are drawn at random. Players then secretly select one of their bullet cards. This is where the bluffing comes in as each player has an identical set of cards: five �click� cards, two �bangs�, and one �triple bang�. Then, on the count of three, players point their guns at each other. Then another count of three is done when players decide whether to drop out or not. If they drop-out they get a shame marker - minus $5000 at the end! Cards are then revealed, with any bang cards played causeing a wound. 3 wounds and your out. Surviving players then divide the loot evenly as far as they can. Whoever is still alive and has the most money after 7 rounds wins. This is a game of bluff and double-bluff and can be a lot of silly, hilarious fun.